Left to right: Taborite Infantryman, Jan Žižka and Teutonic Knight. Who are these miniatures? Welcome to my history lesson. A wise man once said, “Those who do not learn history are doomed to repeat it.” And I don’t want you, dear reader, to be doomed to fighting in a series of 15th century Eastern European wars. The Teutonic Knight was, for many years, the Holy Grail for Blandford Warrior collectors. 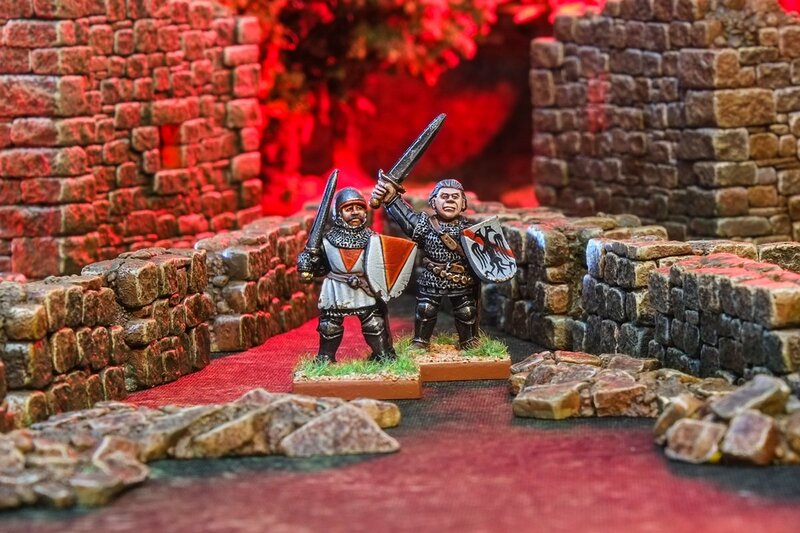 Wargames Foundry had quietly reissued the other eleven Blandford Warriors across a couple of blister packs, making Teutonic Knight the one you had to hunt for as an original 1980s Citadel Minaitures release. Luckily they brought him back in to production at Bring Out Your Lead 2017, so we johnny-come-latelies can be completists. Teutonic knight attacked by Lithuanian horse-archers at the Battle of Tannenberg, 1410. The cover star of the Medieval Warlords book. The Medieval Warlord. Angus McBride paints two colour pictures of him while medieval warlord Gaiseric, with his own whole chapter, gets none! Jan Žižka is sculpted as he would have appeared in 1423, after he lost his right eye to an arrow while besieging the castle of Rábí, and holding the famous fist-shaped mace he used in battle despite being totally blind. Jan Žižka enters Prague with his Orebite Warriors, 1421. The Pope as the antichrist, attended by a large number of whores. The Pope celebrating mass, served by the devil, while an entourage of demons stand around the altar. These vivid religiously-charged images were served up by the Taborites, unhappy with the corruption of the medieval Catholic church, and wanting to spread their ideas to the illiterate peasant masses. For battle they decorated their shields similarly, like this tiny peasant behind earthworks squaring up to the Catholic knight – presumably evoking a David-and-Goliath narrative with the peasant’s sling and relative size of the combatants. The shield design is based on the design of a surviving pavise at the National Museum of Prague. Taborite war wagons await the attack of Sigismund’s Hungarian horsemen, outside Kutna Hora, 1421, Eastern Bohemia. The Taborites were named after their fortified city in Bohemia, which was in turn named after the Mount Tabor of Biblical fame. They were a radical sub-faction of the larger anti-Catholic movement, the medieval equivalent of anarcho-communists who wanted to share everything they had – to the point where they even practised free love. Jan Žižka led them into battle numerous times against the Emperor Sigismund, but eventually found their theology (and perhaps their free love) too radical, and he parted ways to found the less hardline Oberite faction. Pictured left to right: Alan Horseman, Biscuit Dude, Taborite Infantryman, Jan Žižka, Teutonic Knight, Sir John Chandos and Bertrand du Guesclin. Not pictured: Sir-Not-Appearing-In-This-Blog. That’s seven of the twelve Blandford Warriors painted. I almost included Vlad Dracula with this lot, as he was a member of the Ordo Draconis that Emperor Sigismund founded to stamp on people like Jan Žižka. At times like this I love history; it’s like the Marvel Cinematic Universe – a shared reality with potential for crossover events. Coming soon to Ninjabread – Big Trouble in Little Tang Dynasty. Fascinating post from top to bottom! Thanks Riot! I could write ten times as much about the period, it was difficult to stop! I will be really disappointed when you have finally finished off all 12. This is such an interesting series of blog posts portraying a fascinating and beautifully painted set of miniatures. Glorious! I confess I can’t wait to see the Imperial Guardsman most of all. Do I detect a small hint that he might be in the next group? Thanks axiom! I’m looking forward to moving onto an army-level historical project once I’ve finished the dozen, I miss batch painting. But I am enjoying the format of a series of different characters. I am mulling over the idea of doing all the character s from the Trojan War using the gorgeous Foundry range. Or buying up the Wargames Illustrated’s “Giants in Miniature”, which is a growing mishmash of famous historical characters and military Hollywood heroes. Joking aside, your collection of period accurate minis is looking better with each new addition. Jan is my favourite of this lot, imagine riding into battle blind! That dude either had a set of testicles that had to be carried around in one of his war wagons or he was a Jedi. I think the Latter. Congrats on the freehand on the sheild too mate, your skills with the brush astound me. Jan is my favourite of the three as he was quickest to fire out. I need to do a late medieval army so I can blast out a load of dudes in platemail and get a high turnover. 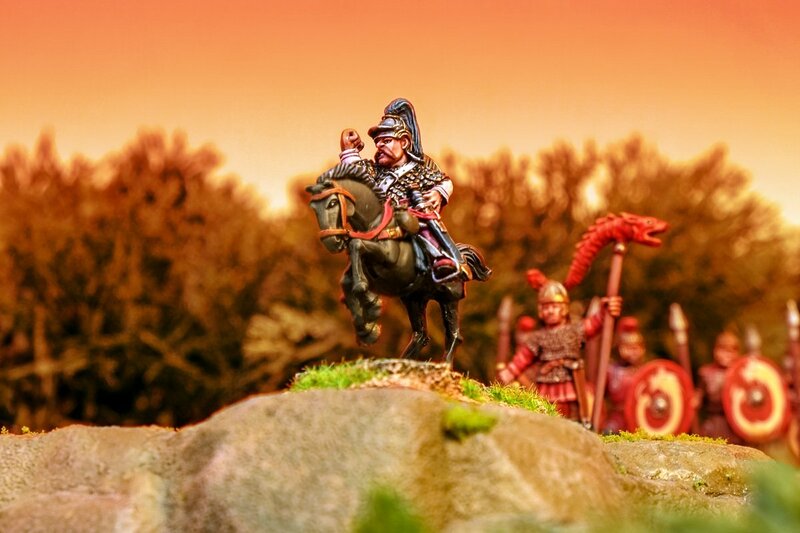 Great article and great work on these miniatures! Lovely work once again. That shield is really something special. Thanks! My dream job would be someone who painted shields for real medieval knights. I see the appeal there. I’d love to do some shield painting myself – viking knotwork designs, heraldic shields, you name it. I wonder if there’s a market out there? Sounds like something historical reenactment societies could have fun with. These figures are just absolutely breathtaking. Thanks for sharing them and a little history lesson. My only knowledge of the Teutonic Knights is from the film Alexander Nevsky. They were bad m’kay. I’ll check that out! I’d like to read up more on them, I guess they were many things during the course of the medieval period.